Applications - Parylene coating has been commercially available for over 30 years and its properties are use in a wide range of applications. The Parylene film is chemically inert, no acid or alkaline material will attack it in any significant manner. The FDA has approved the Parylene film for human implantable devices. The Parylene film possesses superior dielectric properties, approaching 8000 volts for 1 mil thickness. 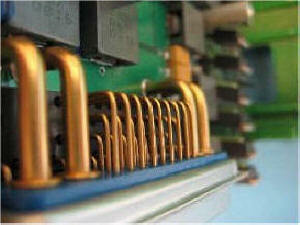 Circuit Boards: Coatings are thin, truly conformal, stress-free and resistant to solvent and fungal attack. Good adhesion minimizes ionic conduction at the coating-substrate interface and strengthens solder joints. Low dielectric constant minimizes loading in high frequency applications. Hybrid Circuits: Good adhesion to ceramic substrates. Good throwing power enables coating within spaces as narrow as 10μ. Interior of packages may be coated via a 1mm hole - coating strengthens wire-bonds and immobilizes particles of debris such as solder balls. 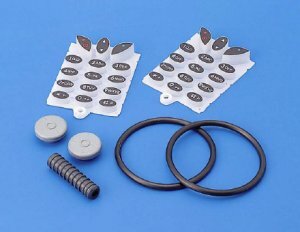 Components: Ferrite cores and bobbins are coated to reduce friction and abrasion in coil forming and to prevent chipping and dust formation. Coating cast metal magnets gives corrosion protection and electrical insulation. 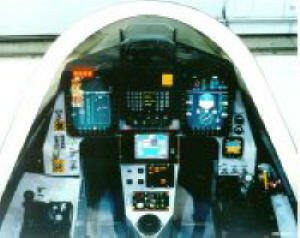 Accelerometers, strain gauges, pressure sensors etc may be coated for electrical insulation and environmental protection. Rubber and Plastics: In the coating process the monomer is able to penetrate the surface of rubbers and plastics giving very good adhesion. A 2μ coating imparts dry lubricant and wear resistance characteristics to the surface. For example silicone rubber keypads are coated to improve the 'feel' of the surface and to protect the printing and 'O'-rings are coated to reduce friction in, for example, syringes. A thicker coating improves chemical and solvent resistance. Optics & Instrumentation: The excellent optical and barrier properties of Parylene and the stress-free nature of the coatings find many uses in this field, particularly in protecting moisture-sensitive elements such as potassium bromide windows. Freestanding films of Parylene may be produced by stripping the coating from suitably prepared glass plates and are used to produce windows and other components in instrumentation. Strengthening paper in old books and manuscripts: Books may be coated without dismantling them. Preserving archaeological artifacts particularly those from underwater sites such as the Titanic, Coating explosives and solid rocket fuels to make them less moisture sensitive and to modify other characteristics. 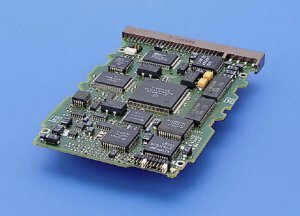 Ultra-thin Parylene conformal coatings provide magnet and ferrite core applications excellent dielectric properties. With a lower dielectric constant, lower dissipation factor and high dielectric strength compared to industry-standard coatings, Parylene coatings are uniquely suited for electrical insulation on miniature wire wound components. Parylene coatings also provide protection against abrasion damage that may occur during the winding process. Finally, Parylenes dry lubricity (low coefficient of friction) is also beneficial in the winding process. The use of adhesive tape as insulation between winding and metal component is a well established process however as components get smaller, application of tape becomes difficult, in many instances resulting in less yield of acceptable parts. A coating of Parylene can virtually eliminate faulty components while improving electrical performance. 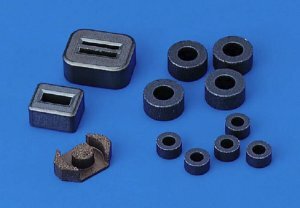 Molded plastic NdFeB magnetic components are fragile and an additional advantage of a Parylene coating is increased strength. NdFeB material is also very susceptible to corrosion from atmospheric moisture. The extremely low water vapor transmission properties of Parylene provide excellent protection against corrosion. 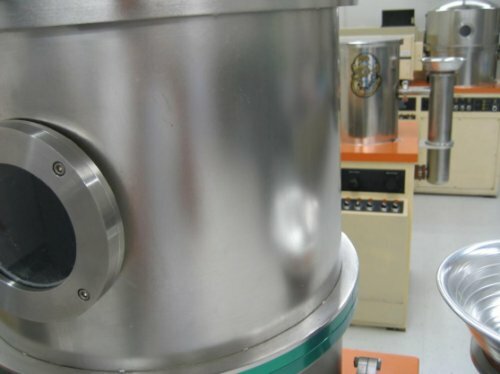 Parylene coatings often also offer a reduction in processing and labor costs since it is possible to coat many thousands of parts simultaneously using a tumble system during the vapor deposition process. Liquid Coatings do not provide even coverage across all surfaces of a coil form. Build-up of conventional coating material on a coil form can restrict windings capacity compared to an uncoated form or a form with a thin and uniform Parylene Coating. Thin and uniform Parylene coating has little effect on the shape and capacity of a coil form. Discovered in the 1940s, parylene is a polymer created from a chemical compound known as dimer, which is in powder form. Read more about the history of Parylene conformal coating.